‘Wwoof’ stands for World Wide Opportunities on Organic Farms and ‘Wwoofing’ refers to carrying out work on organic farms voluntarily for about four to six hours a day in return for food and accommodation. Basically, it’s an amazing way to travel on a very low budget and, arguably, you will have a far more rewarding experience than travelling around spending lots of money on accommodation, meals out and paying to get into tourist attractions. Personally, as someone who has done a little bit of travelling, I found the Wwoofing experience infinitely more meaningful than just making my way around Europe, taking in sights and experiences but not giving anything back, like you do with Wwoofing. Wwoofing is likely to appeal to someone who’s interested in sustainable living, being more self-sufficient and growing their own food organically. I spent six weeks Wwoofing in England, but you can do it pretty much anywhere in the world. If you don’t speak the language, it may obviously be more challenging going abroad. You also need to be unafraid of getting your hands dirty and a bit of hard work. If you don’t appreciate the broader education you’re gaining, then it may just feel like boring, menial work, but when you’re working alongside others from all over the world, having conversations about life, it doesn’t seem to matter how mundane the task is. Depending on the time of year, the work varies; you may be sowing seeds, weeding, digging, harvesting, feeding chickens, gathering their eggs…the list goes on. The first place I went to on my Wwoofing adventure was Monktyn Wyld Court in Dorset. Monktyn is set amongst typically idyllic, lush, green English countryside (and is the photo above, of the cottage with beautiful flowers round it). Around 10 to 15 people live here permanently and there is a beautiful old rectory, which serves as a vegetarian B&B that brings in income for the community, along with various sustainable education courses, which members of the public can pay to attend. Monktyn Wyld takes in Wwoofers primarily to assist with their vegetable garden, which feeds community members, volunteers and guests. They also ask for assistance in the kitchen and the B&B about once a week. I found the residents warm and welcoming, and there were about four other lovely Wwoofers there at the same time. I got my own room at Monktyn, which is not always the case with Wwoofing. Depending on the facilities available, you may have your own room in a house, or you may be sharing a dorm, staying in a caravan or camping. If the accommodation arrangement at a particular farm isn’t right for you, there are plenty of others to choose from. One of the highlights at Monktyn was the tasty, nutritious, organic food cooked for you twice a day, which is awesome after a hard day toiling in the fields! You do get two days off per week with Wwoofing and I used the time to walk about 40 minutes through the fields to a gorgeous little seaside town called Lyme Regis. Despite needing wellies, I couldn’t really go too far wrong, because the directions on how to get there were all written down on laminated card! Very helpful. Next on my itinerary was Bosavern Community Farm. Bosavern is right next to a historic Cornish village called St Just, 20 minutes’ walk from the sea. Accommodation was in the farm house; again, I had my own room. Here we had all our food/ingredients provided, but we cooked for ourselves. The cooking turned out to be lots of fun, using all the beautiful organic veggies, eggs from the farm and artisan bread from the shop. At Bosavern, they grow organic vegetables and have free-range chickens that produce eggs to sell in their community shop on the farm. My crooked attempt at lettuces at Bosavern! Once a week, it’s your responsibility to start an hour earlier (8am instead of 9am) and you let the chickens out of their houses in the morning, feed them and then collect their eggs twice during the day before putting them to bed at night. The most unusual experience was when new young chickens arrived, they didn’t know how to roost and we had to lift each chicken onto their roost one by one at dusk. There were about 50 of them! They need to sleep on a roost because it’s warmer, and they are safer from predators up high. Outside of work, we would go to the pubs some evenings, as there were open mic and folk nights during the week. Highlights at Bosavern included walking along the cliff tops to Land’s End and Sennen Cove on one of my days off. 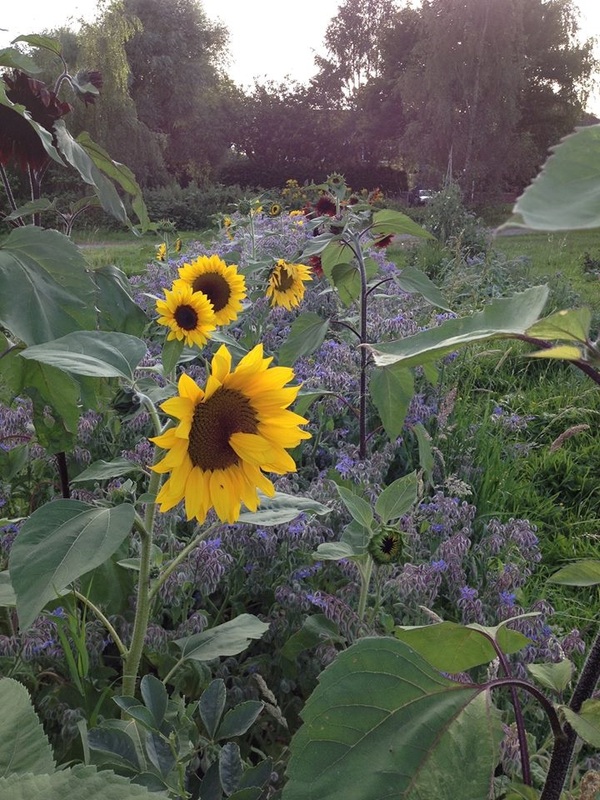 The last two weeks of my Wwoofing experience were at Trinity Farm near Nottingham. This was my most rustic Wwoofing experience, but was no less fun than the others. My accommodation here was a caravan, which turned out to be still under renovation, so I shared a caravan with another Wwoofer – the lovely Morgan from France – before moving into my own caravan a few days later. 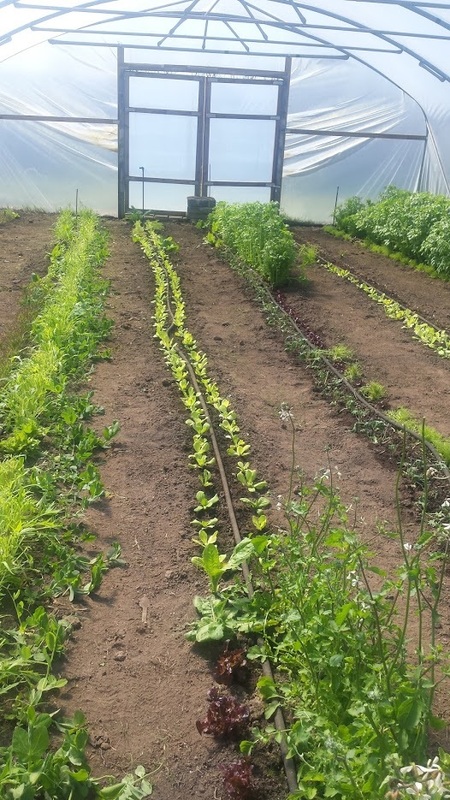 Trinity farm has a shop, and they sell the organic and biodynamic vegetables and plants they grow, along with eggs from their free-range chickens and other health foods and products. They also have a café. Luckily, as they have two chefs, this meant our lunches and some of our dinners were chef-prepared! No complaints here. There was a really lovely community feel at Trinity, as several people live and work there. Tom was in charge and he was only too happy to share his wealth of knowledge on biodynamic growing. Wwoofing was without a doubt my best travel experience over the two years that I was in the UK (I’m now back in my native country of New Zealand). I remember being slightly concerned about whether it was a safe way to travel as a female by myself, but I never once felt unsafe. The thing to remember is that people who have adopted an ethical way of living, such as organic farming, tend to be gentle people. If you’re interesting in meeting like-minded people and making friends from around the world, experiencing living in community and seeing real countryside, not just the tourist hotspots, whilst spending next to nothing, I highly recommend it. Being outside in the fresh air, exercise, healthy food, lovely people and just living simply, slows down the pace of life and does wonders for the soul. To find out more check out www.wwoofinternational.org. This entry was posted in International and tagged organic farms, travel, Wwoofing. Bookmark the permalink. Reblogged this on Essential Healing NZ. What a wonderful and open-hearted article! Hopefully a true encouragment to anyone wishing to explore a sustainable lifestyle. Thanks Lewis, that’s really nice feedback to get. How can I apply ?? ?